It is unlikely for you to use solar oven plans when building an outdoor cooker for survival purposes but having instructions, especially those with images, is helpful. The variety of sun-powered ovens stems beyond the simple cardboard ones so often seen, as you can create a tabletop cooker, another made of a rubber tire, cob or opt for a heavy-duty version. Each solar oven performs the same but it is good to have options because in a survival situation, you do not know what materials are going to be available or which homemade appliance is going to work best. You are probably aware of the movement to go green, you may even be part of it but you might also think, why a solar oven. People living a hundred years ago used wood-burning stoves while the people before them used twigs, grass and brush to build a fire to cook their food, so why deter from a standard that works? 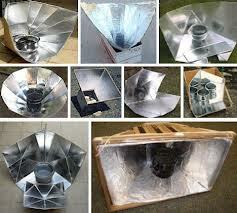 For starters, solar ovens do not deplete any natural resources or cause pollution. You also do not have to waste time trying to light wet logs or worry about how to start a fire without matches or lighter fluid. 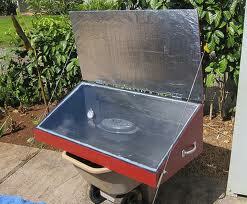 As long as the sun is shining, even if it is a little cloudy, you can use a solar oven to cook all your food. Although a table may not provide a huge difference in elevation, it does alter cooking time simply because the solar oven is now a few feet closer to the sun. While you might be able to get away with using a table you already have and placing a cardboard cooker on top, it is sure to vary quite a bit from the tabletop appliance portrayed in the solar cooker plans. If you want to optimize your solar cooking experiences, then making the table, which uses polycarbonate sheet, a shiny, thin, stiff, silver paper-type product, for reflectors is the best option. You might want to create a solar oven because you care about the environment and are following in the green movement, in which case, the idea of using a tire to make a cooker may or may not appeal to your interests. Personal opinions aside, if you are in a situation that requires you to enter survival mode, a rubber tire solar oven could be your only option for sustaining your life. Simple as it is to create this device, you may still want to use solar oven plans to ensure that you do everything correctly, especially since you are likely to be in a situation where failure is not an option. Creating a cob cooker, solar or not, is the ideal way to prepare your food because it is durable, can withstand the elements and you only have to build it one time. To make this type of cooker, you definitely want to use solar oven plans because you need to adhere to certain dimensions and materials, though some improvising may be necessary in a survival situation. Still, having a guide is beneficial in comparison to having no instructions, especially when you need to create a clay-based mixture and have to account for drying time. 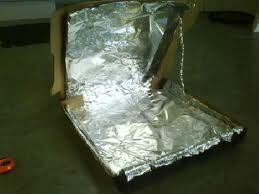 You might like to keep things simple by using a cardboard box to make a solar oven or maybe you already prepared for the worst by building a small, portable sun-powered cooker. In either case, having solar oven plans is a survival tactic you should not overlook, as they are a lot easier to transport than a pre-built cooker and provide you with options, ensuring you always have a way to cook your food.